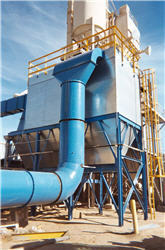 The 40,000 ACFM collector vents a sand and aggregate fluid bed dryer operating at 140 degrees Farenheit. Inlet loading for the collector is a demanding 15,000 lbs/hr (44 gr/cf), with outlet emissions of .02 gr/cf. The Sly Model STJ-3215-10 collector features a high side inlet and large drop-out section, slowing velocity to remove heavy particulate before it is filtered by the collector’s 16 oz polyester filter bags. Because the dryer being vented occasionally is fired by high sulfur fuel oil, special design considerations were made. The collector has a stainless steel tube sheet, internal epoxy coating and 3" of fiberglass insulation to address potential corrosion.